Huang Qingjun and Ma Hongjie … project ‘Family Stuff’ [aims] to portray rural Chinese families and their possessions …. A series of 20 images has been compiled that were exhibited at the 798 Photo Gallery in Beijing in 2007… . In 2011 the project is scheduled to end with a total of 50 pictures and a book. This post is part of an occasional series. In the capital of Turkmenistan stands an enormous statue of a book. Every evening at 8PM, the statue swings open and a recently deceased dictator’s magnum opus, the Ruhnama, is broadcast throughout the square while a video from within the statue shows his image. The post links to a documentary maybe by Finnish filmmakers and available on YouTube in 10 parts. I did not watch the whole thing. In this part, however, at about the 4:35 mark, there’s some twilight / nighttime footage of the book swinging open. I know precisely zero about the rather dodgy-sounding politics here, but an immense book that swings open, onto which video images are projected, is fascinating. Click to see YouTube video; I’ve punched up this image a little. I don’t know how closely you’re following the inquiry over in Great Britain about that country’s decision to involve itself in the Iraq war. And I don’t have much to say about that. But hey, how about the logo! What do you think of the type treatment? Is this going to make the Iraq Inquiry the breakout inquiry of 2010? How awesome is it that there is actually a company called Giant Manufacturing Co.? That’s like something on The Simpsons. Stories I might have missed: How is the downturn affecting illegal drug use? What I haven’t seen is how their profits are holding up over the past six months or so. Is the downturn affecting demand for illegal drugs? One way or the other the answer would be interesting. Has that been written about and I just missed it? 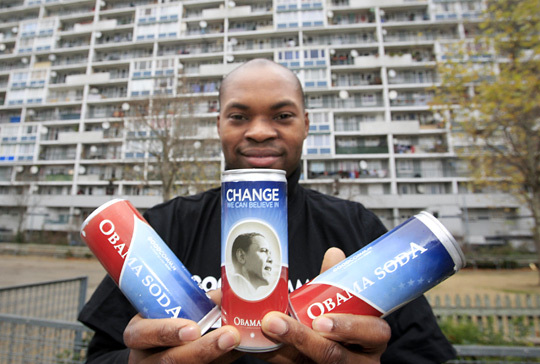 Obama Soda, available in France — proof that the French really do know the meaning of the word entrepreneur (as the old joke goes). NPR story here. At Selfridges. Via The Dieline. The term “emerging markets” dates back to 1981, recalls the man who invented it, Antoine van Agtmael. He was trying to start a “Third-World Equity Fund” to invest in developing-country shares, but his efforts to attract money were being constantly rebuffed. Ospop sneakers. Yes, they’re made in China by Chinese workers. But more unusually, and more to the point, they are inspired by Chinese workers. Specifically, Ospop sneakers are based on a design widely worn by such laborers, but with higher-quality materials and structural improvements meant to appeal to a Western audience — one that is, not incidentally, willing to pay $75 for a pair of sneakers. Read the column in the August 17, 2008, issue of The New York Times Magazine, or here. Consumed archive is here, and FAQ is here. Consumed Facebook page is here. On occasion I’ve wondered why it is that “public service”-style marketing campaigns often seem so much less effective, less potent, than marketing campaigns on behalf of a product or service. With that in mind I was interested in this article in the Times business section yesterday by Charle Duhigg. It’s about a public-interest organization focused on disease prevention in developing nations, teaming up with multinational consumer-products corporations with track records of “creating habits” via marketing. Wow! You won’t hear a blunt description of demand-creation than that anytime soon! Anyway, I digress, but the Febreze anecdote alone makes the article worth reading. Back to the point. The piece explains how the role of advertising/marketing has in effect created good habits (hand washing, which greatly cuts down on the spread of certain ailments) via marketing that happens to yoke those habits to a product (soap). So this brings me back to my curiosity expressed above. Are these companies just that much better at the persuasion process? Or, given that agencies/etc. who execute their campaigns also do plenty of traditional public service stuff, is it that there’s something about introducing the profit motive that affects the approach and increases the effectiveness? Is there some intrinsically more compelling about a “good habit” when it’s tied to a consumer good? Is it simply a matter of scale — ie, these consumer-goods firms have the budget to blow out a message in a far bigger way? I doubt there’s enough of this sort of thing going on to cause a significant difference in overall retail sales, not enough at least to explain why consumer spending hasn’t collapsed — not yet at least — to the degree Mandel’s earlier writings have suggested they will. But he makes a good point: It would be better to have the details on this information, especially given that a weak dollar and other factors are likely to increase overseas sales. This week Consumed looks at spending money — on other forms of money. Currency prestige has a long history in the context of nation-states, but the idea that individuals might find some forms of money more desirable than others is less familiar. Perhaps rising awareness of the falling dollar is changing that. Read the column in the May 11, 2008, issue of The New York Times Magazine, or here. So, see that giant representation of a beer bottle? That’s a coffin. Apparently. Or maybe this is a hoax of some kind. Other branded examples include a giant Coke bottle, and an Air Jordan coffin. Murketing’s Sponsored Film Virtual Festival: Why Braceros? This 19-minute film, “Why Braceros?,” was produced in around 1959 on behalf of the Council of California Growers. It aims to tell viewers about “the benefits of the bracero program,” The Field Guide to Sponsored Films explains, “originally initiated by the United States in 1942 to alleviate the World War II labor shortage.” This was a “guest worker” program that made it okay for Mexican labor to be brought in seasonally to work on cotton farms and other manual jobs (“stoop labor,” it’s called in the films).